Meizu Confirms April 23 Launch Event for Meizu 16s - Playfuldroid! Yesterday, Meizu had confirmed through Weibo that it will be making an announcement today. The Chinese firm has stated that it will be holding an unveil event on April 23 to announce the Meizu 16s flagship phone. The smartphone will be arriving as the successor for the Meizu 16 Snapdragon 845 SoC flagship phone from last year. The launch poster reveals that the Meizu event on April 23 will begin at 7:30 PM. 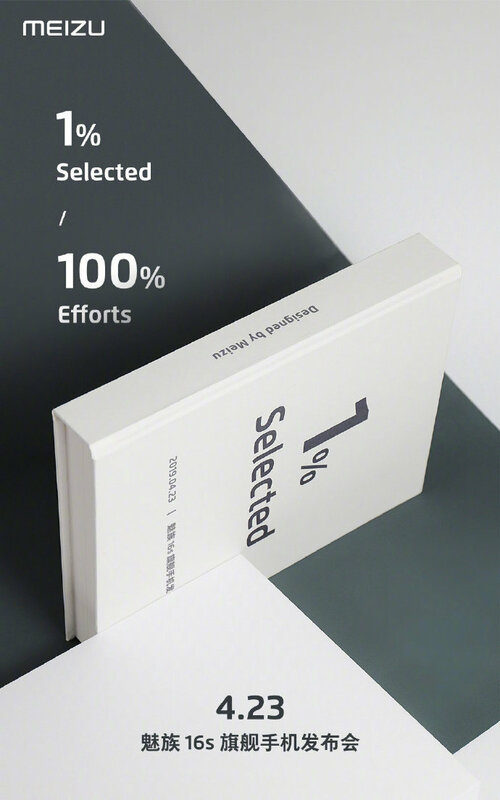 The “1% Selected / 100% Efforts” text could be hinting that the Meizu 16s has one of the best designed smartphones. The Meizu 16s has recently bagged approval from TENAA through which its entire specifications have been revealed. It will be arriving with an AMOLED display of 6.3 inches. It will carry support for full HD+ resolution and it will be embedded with an in-screen fingerprint reader. The Snapdragon 855 SoC will be powering the Meizu 16s with 6 GB of RAM. It may come with 128 GB of storage. The handset will include a 3,600maAh battery that will carry support for 24W fast charging. For photography, the handset will include OIS enabled 48-meapixel + 20-megapixel dual camera setup and a front-facing camera of 20-megapixel. The smartphone was recently spotted on AnTuTu benchmarking with impressive average benchmarking score of more than 370k.